For the game, see: 1830 . Year 1830 (MDCCCXXX) was a common year starting on Friday (link will display the full calendar) of the Gregorian Calendar (or a common year starting on Wednesday of the 12-day slower Julian calendar). 1830 is known in European history as a rather tumultuous year with the July Revolution, the Belgian Revolution and the November Uprising taking place in respectively France, the Low Countries and Poland. January 11 – LaGrange College (now the University of North Alabama ) opens its doors, becoming the first publicly chartered college in Alabama . February 3 – Greece is liberated from the Ottoman forces as the final result of the Greek War of Independence. March 12: Craig vs. Missouri: The United States Supreme Court rules that state loan certificates are unconstitutional. March 26 – The Book of Mormon is published in Palmyra , New York . April 6 – Joseph Smith and 5 others organize the Church of Christ (later renamed the Church of Jesus Christ of Latter Day Saints), the first formally organized church of the Latter Day Saint movement, in northwestern New York . May 13 – Ecuador separates from Gran Colombia. May 28 – The United States Congress passes the Indian Removal Act. June 26 – William IV succeeds his brother George IV as King of the United Kingdom . July 5 – France invades Algeria (see French period in Algeria). July 13 – The General Assembly's Institution, now the Scottish Church College, one of the pioneering institutions that ushered the Bengal Renaissance, is founded by Alexander Duff and Raja Ram Mohan Roy, in Calcutta , India . July 17 – Barthélemy Thimonnier is granted a patent (#7454) for a sewing machine in France ; it chains stitches at 200/minute. July 18 – Uruguay adopts its first constitution. July 20 – Greece grants citizenship to Jews. 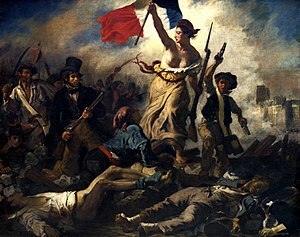 July 27 – France: The July Revolution begins (see also 1830 in France). August 9 – France: Louis Philippe becomes King of the French . August 13 – France: Duc de Broglie becomes Prime Minister. August 25 – The Belgian Revolution begins. August 31 – Edwin Beard Budding is granted a patent for the invention of the lawnmower. September 15 – Liverpool and Manchester Railway opens the world's first intercity passenger railway operated solely by steam locomotives. October 4 – The Provisional Government in Brussels declares the creation of the independent state of Belgium , in revolt against the United Kingdom of the Netherlands. November 2 – France: Jacques Laffitte succeeds the Duc de Broglie as Prime Minister. November 8 – Ferdinand II becomes King of the Two Sicilies. November 22 – The Whig Charles Grey, 2nd Earl Grey succeeds Arthur Wellesley, 1st Duke of Wellington as Prime Minister of the United Kingdom. November 29 – The Polish insurrection begins in Warsaw against Russian rule. December 5 – Hector Berlioz's most famous work, Symphonie Fantastique, makes its world premiere in Paris. December 20 – The independence of Belgium is recognized by the Great Powers. 10,000 chests of opium are sold in China . June 1 – Sahajanand Swami, believed to be an incarnation of god by his followers, leaves his mortal body (b. 1781).